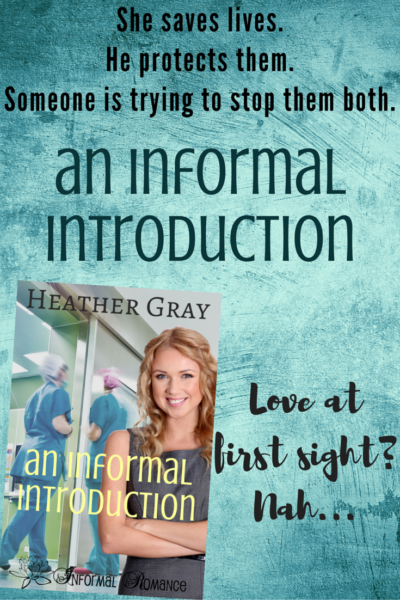 An Informal Introduction is here. Alas, their story is finally ready, and I can’t wait to share it with you! She saves lives. He protects them. And someone’s trying to stop them both. As if the flashing lights in her rearview mirror weren’t enough, the trooper turned on the siren, too. Lily cringed and slid down in her seat like a teenager hiding from prying eyes. Of course, her teen years were long behind her, and any eyes intent on prying would need night vision goggles to see her. The sun hadn’t yet kissed the eastern horizon. She slowed and sought a place to pull over, no small feat on this narrow stretch of Lee Highway. Spotting a patch of grass to her right, she steered her silver two-door sedan as far over as she could and cut the engine. Her fingers drummed a rhythmless beat on the steering wheel as she waited for the trooper. He was probably busy checking with dispatch to make sure she wasn’t a mass murderer. Because, clearly, rampaging homicidal maniacs drove nondescript cars on the way to the hospital in the wee hours of the morning. In all her years traversing this road, Lily had never seen a state trooper on this particular stretch. Until today. Good thing she’d left early for work. Thank you, God, for getting me up and out the door when You did. The trooper climbed out of his cruiser and approached her parked vehicle. She hit the button and listened to the almost imperceptible hum as her window slid down. The grey of his uniform would have blended into the night were it not for the illumination of his headlights and his car-mounted spotlight. As it happened, they blinded her enough that she couldn’t catch much more than the color of his clothes and a hint of his shape. “License and registration, please.” The voice was impatient. Tired, too. He was probably at the end of his shift, which meant she had little chance of winning the argument, but she wouldn’t let that stop her from trying. So much for the serve part of public service. The trooper’s shadowed mouth hinted at a smile, and his eyes morphed from intense pinpoints to… Hm. Eyes couldn’t be huggable, could they? Who was she kidding? She couldn’t even see his eyes. Her imagination had to be on overdrive. “Well, ma’am, most people consider those flashing red and blue lights as proof enough that I’m one of the good guys, but if it would make you feel better, I’d be happy to go turn the siren back on, too. I doubt crazed rapists announce themselves with police sirens.” Now that he was speaking in actual sentences, Lily picked up a hint of honeyed Southern drawl dancing along the edge of his words. She never could resist Southern charm — real or imagined. “Here.” She handed him her driver’s license and the other paperwork from her glove compartment. He examined both and called her license information in, using the small radio strapped to his left shoulder. He stepped back from her car and listened carefully to whoever was on the other end of the radio. If it was even a real person. The garbled, static-like squawking left that in doubt. Once the radio quieted, the trooper began entering information into a form held in place on his clipboard. 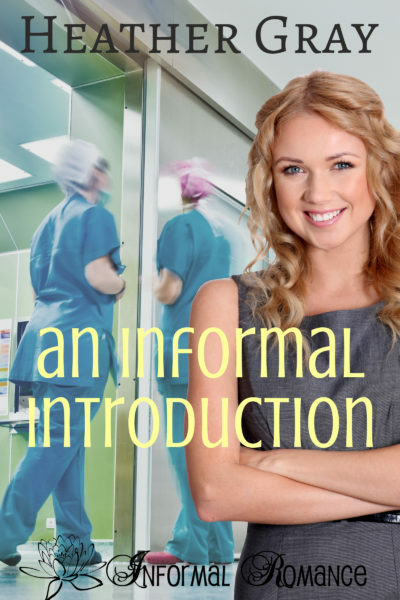 Click to pre-order your copy of An Informal Introduction for 99cents! Yay!! Thanks for stopping by today Narelle (and for wanting to read something I’ve written!!). ^_^ I hope you enjoy a fantastic weekend! Oh, the traffic is dreadful, Heather. That’s part of the reason why we moved south. You’re right though, there’s so much history. I am hooked. Ordered my copy and can’t wait to read your inspiring romance next week. When given the opportunity I enjoy visiting our nation’s capital and surrounding historical sights. Had several great family vacations there. Can’t wait to see how you weave details into your story. Have a great weekend. Can’t believe it is already the end of April? Time whizzes by! I loved An Informal Christmas, I have no idea how I missed An Informal Arrangement, but I know I’m looking forward to An Information Introduction. (The sneak peak reminds me of Home Is Where the Heart Is from Kimberly Rae Jordan–Dean also stops Violet, but in that scene she was indeed speeding.) I’m curious now about why Caleb stopped Lily… my mind is already wandering: was her car involved in some ordeal? was someone trying to mess up with her already and flagged her license? I know this is going to be a good one. Your sneak peek really drew me in. I had already pre-ordered the book earlier this week since I have been enjoying the series. The funny thing that caught my attention was the fact that Lily was pulled over but knew she hadn’t been speeding. The same thing happened to me when I wasn’t speeding but it was in a restaurant parking lot of all places. I thought that the WV state trooper wanted to pull in where I was stopped since he had stopped also. I thought he was waiting for me to come around to let him make the turn where I was stopped. To make a long story short, he was lining up where he was to back into a space. That made it look like I was trying to come around him which I was wasn’t.I was only trying to move out of his was so he could pull in where I was sitting. I was dumbfounded when he jumped out of his car and demanded my driver’s license and registration. He had the nerve to tell me I was a wreck less driver. He didn’t even have his signal on showing that he was going to back into the space. He also informed me that it is against the law to drive across parking space lines. Anyway…no ticket for me. My record was clear. 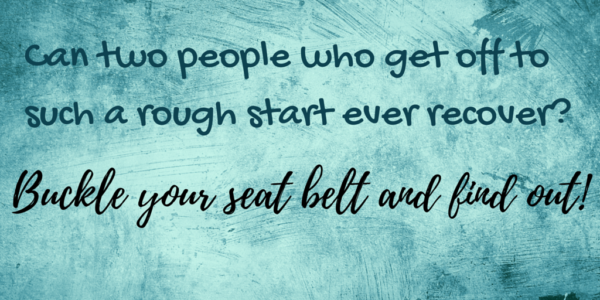 I have been driving for almost 50 years with no tickets or accidents so I knew if I was in the wrong or not, which I wasn’t. Everyone I have told this to has mentioned that I should have reported him. I was so dumbfounded that I didn’t even get his name or badge number or trooper car number. My hubby and 15 year old grandson were with me and they also couldn’t believe how was I being talked to and treated. We have a running joke now and call him the super trooper. I was telling them that he was probably late for his dinner at the restaurant since I saw how fast he was driving into the parking lot. I am also familiar with Lee Highway since I grew up in the DC area. We now live in the southern part of West Virginia and drive Lee Highway in the Southwestern area of Virginia. I’m looking forward to your new release! We live in Burke, Virginia near where your story opens. That makes it fun. What a fun introduction, Heather! Not the ticket so much. Thanks, Heather! Your story sounds intriguing. I’ve got it preordered and can’t wait to read it. Thanks for sharing your thoughts and talents! Fun excerpt! I really enjoyed the other “informal” books! What a crazy start! Can’t wait to see how it turns out! Looking forward to reading Caleb and Lily’s story! I’m thankful for preorder so I don’t miss it.